Since the smart meter was installed in her house without her consent totally changed her life, she is now suffering from Extreme nausea sleeping problems, sharp surges of pain throughout the whole body, sharp palpitation in the heart and sharp shake in her brain. The Criminal authorities have ignored her complains and refused to do anything about it. A very important document by Dr. Pall, in which he says among other things that smart meters should be abolished. This should be circulated widely, to MLAs, MPs, to health officials like Perry Kendall and his successor, and with your doctors. Microwave radiation from these six smart meters penetrates through the brick wall of this townhouse and causes very strong exposure levels inside the house. A young child spends most of her time in this living room, near to where the meters are located. Her health is being endangered by exposure to this radiation. It is unfair for Festival Hydro to put these people in such danger. Criminal and civil litigation could result from careless siting and use of this very dangerous technology. About three months ago, the old but perfectly servicable electric meter was removed and replaced with a ‘smart meter’ which sends information to the electrical utility company by microwave radiation signals. A ‘smart meter’ was recently placed on this house. It replaced a safe electricity meter that was perfectly servicable and did not need to be changed. The meter is located on the outside wall of a bedroom. The microwave radiation from the meter, penetrates through the brick wall and engulfs the bedroom in very strong, very dangerous microwave radiation. Other areas of the house are also affected, to a lessor extent and the resident reports ill health effects since the meter was installed. The radio frequency meter shows how strong the radiation is and the sound illustrates how ofter the meter is transmitting. These Smart meters have been badly named, there is nothing smart about an electricity meter that harms people, animals and the environment. Festival Hydro, who installed these meters throughout Stratford, now face huge liability issues from citizens who are made ill from the radiation. SEBASTOPOL, Calif. — Some California coastal communities have placed moratoriums on Pacific Gas and Electric’s SmartMeters after customers raised concerns about potentially harmful health effects. Homeowners addressed the California Public Utilities Commission in September, asking the commissioners to place an emergency moratorium on PG&E’s wireless gas and electric Smart Meters. The CPUC told KCRA 3 that it has received more than 2,000 health-related complaints but said the health issues are not its jurisdiction and referred customers to the Federal Communications Commission and state health officials. A Sebastopol-based group, the EMF Safety Network, studies the health impacts of electromagnetic fields and radio frequency radiation. The group said it is collecting data that proves PG&E Smart Meters are hazardous to human health. A number of the people who said they are getting sick said they suffer from a condition called electrical sensitivity or electromagnetic hypersensitivity, or EHS. The World Health Organization said EHS is not a medical diagnosis. However, people who claim to suffer from electrical sensitivity said their symptoms are very real. “The trouble is, a lot of times, people don’t connect the dots between their health symptoms and electrical exposure,” Sandy Mauer with the EMF Safety Network said. 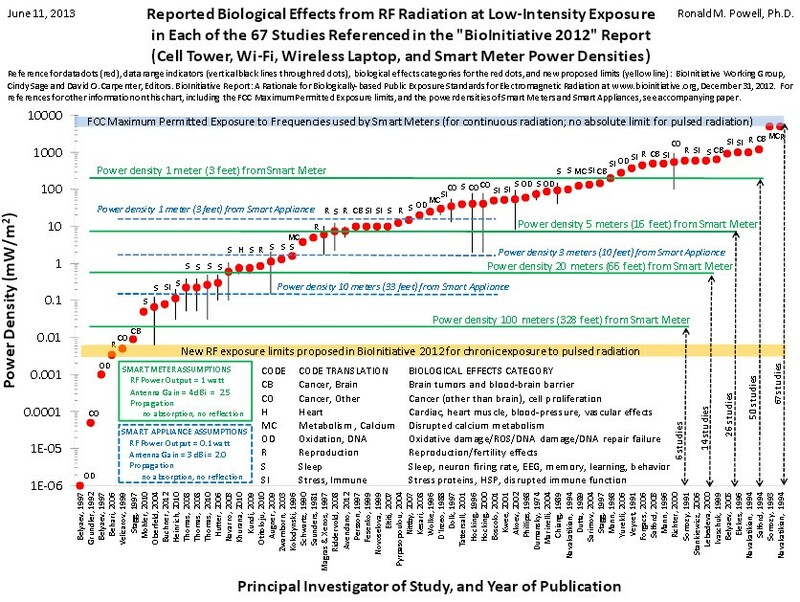 The WHO said there is no convincing scientific evidence that weak RF signals from wireless networks cause health problems. SmartMeters emit about one watt, less than cell phones, which some research finds riskier because they are held to the head. PG&E said its meters comply with federal safety standards. “Radio frequency is all around us,” Paul Moreno from PG&E said. Moreno said before PG&E rolled out its SmartMeters, it commissioned independent experts to examine how SmartMeters’ RF levels stack up against other common household devices. San Rafael Assemblyman Jared Huffman has received complaints from a number of his constituents. He has asked the California Council on Science and Technology to examine SmartMeters and whether current FCC standards are sufficient to protect public health. “I think that’s going to be hugely helpful to take this debate to one based on sort of fear and a dismissive response to that fear, and try to inject some independent credible science,” Huffman said. The council could release its report by the end of 2010. Assemblyman Huffman addressed that concern saying no matter what conclusions the Council on Science and Technology returns, he is considering looking at some kind of opt-out option for customers who do not want smart meter technology on their homes. PG&E said it takes customer concerns very seriously. It has met with a number of communities who have raised health-related concerns, in an effort to raise awareness and educate customers. PG&E continues to deploy some 10 million meters in its territory statewide, complying with the CPUC’s SmartMeters proposal to install the wireless meters on all customers’ residences. In the meantime, there is no resolution for customers who said SmartMeters are ticking time bombs. Do You Have a New “Smart” Meter? Smart-grid projects are supposed to “meet strict cyberspace guidelines”(6); but that has not happened, because greed trumped everything else: our health, safety, precaution, and any remnants of law. Government corruption is endemic, while Wall Street behind-the-scenes manipulation and the bankers theft of trillions of taxpayer dollars is ignored. White-collar crime is rarely prosecuted, because (1) there are few honest people left in government; and (2) those in charge are part of the bigger problem. All Precaution was thrown out in the race to compete for millions of fiat dollars. Without an informed and educated public and with the mass media compliant to elite and secret plans, no one is told the truth. There has been no public discussion on the known biological hazards, both to humans and our pets, with these new meters. There has been no testing of these meters for any kind of safety. However, utilities Public Relations “spin” includes that: they will cut power costs to consumers, thus lowering your monthly bills; help customers reduce power consumption during peak times; and the meters can be read anytime, via a planned new “grid” in the works for the entire country that will use these meters. Utility companies insist these meters are safe. “Smart” Meters are a new type of electronic device that monitors electricity, natural gas, and water usage via radio frequency (RF or rf) in an invisible but dangerous range, between 2.4GHz [GigaHertz] and 5.8Ghz. This corresponds to the electrical signals frequency used to produce radio waves. The worldwide digital wireless communications network is based upon this. RF has both an electric and magnetic components both of which can cause damage. Hertz, abbreviated Hz, is a unit to measure Alternating Current (AC), sound and ocean waves, and electromagnetic waves. It is an internationally recognized measurement equal to 1 cycle per second: e.g., 1,000 cycles per second = 1,000 Hz. 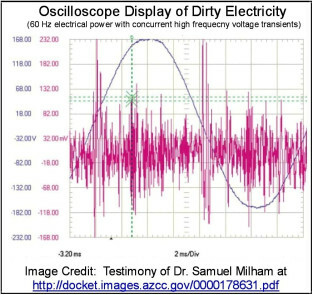 It is well known in scientific community that over 33 Hz, these invisible waves of energy damage many aspects of our biology and our ability to think clearly. These new meters can be read any time via their continuous wireless linking to the cell-towers. They can detect all your household usage of appliances, lights, etc. This information can be shared with and/or sold to other companies, so you no longer have any privacy. It is a spying device. These meters are not secure. They also can be hacked into, so it is possible for someone to know if you are not home (by lack of power usage). There are also “collector” meters used to gather and transmit RF/microwave radiation signals from various surrounding buildings and then “retransmit RF information for somewhere between 500-5,000 homes or buildings.” In addition, the utility company now also has the ability to control your own usage. Via these new meters, the power company can shut off your home usage, your block or community, or city usage without notifying you. What excuse will people be given, if power is shut off without any notification to customers? Do you remember the Enron debacle, and the enormous overcharging of millions of Californians? As part of the placement of a nationwide “smart grid,” there are additional plans to have individual power transmitters built into in all new appliances to measure the energy use of each one (washing machines, clothes dryers, dishwashers, etc.). This means that in every home or apartment there may be dozens of power transmitters for kitchen and laundry appliances that will send energy use, via wireless radio frequency, back to the “Smart” Meter. In addition to a complete lack of safety, are these power transmitters part of untested nano-technology? Are consumers told at point-of-purchase that a new appliance has a power transmitter in it? A consumer must be willing to have these new appliances constantly transmitting power usage to the utility company. Or, they may be mandated via federal legislation. So far, “Smart” Meters have not been “optional” in most areas around the US and Canada. This is another illegal invasion of our privacy, health, and safety. However, in northern California more than 44 municipalities, including eight counties, “have criminalized the installation of, banned or taken resolutions out against ‘smart’ meters.” In Maine, Central Maine Power Company [CMP], has a $200-million meter project [half of it funded by the federal government] and plans to install 600,000 new meters throughout the state. CMP was taken to court because numerous people became ill, once a new digital “Smart” Meter was installed. A landmark legal decision was made on May 25, 2011, “that represents the first time any [US] state had ordered an electric utility to permit customers the choice to op out of a smart meter program.” Did the attorneys handling this case not know that there was no federal mandate? Last February, Connecticut’s Attorney George Jepson sent out a press release urging Connecticut Light and Power Company [CL&P] not “to replace existing electric meters with advanced technology [that] would be very expensive and would not save enough electricity for its 1.2 million customers to justify the expense. …The pilot results showed no beneficial impact on total energy usage…and the savings that were seen in the pilot were limited to certain types of customers and would be far outweighed by the cost of installing new meters.”(15) This press release was ignored. The protective Blood Brain Barrier has been breached; and there are numerous studies that show that “exposure to low levels pulsed or continuous microwave radiation has been reported to affect neurotransmitter metabolism…” while other studies suggest that “RF radiation can alter the electrical activity of the brain” and changes cognitive function and behavior. Although there has been very little reported in mainstream media, there is extensive information available information on the Internet. Health problems, due to constant exposure of RF radiation, already reported include: migraines, nausea, vomiting, vision impairment, ringing in the ears (tinnitus), muscle spasms and nerve pain, heart palpitations, chest pain, and sleeplessness caused by intense bursts (pulsing) of radiofrequency radiation that has recently been classified as a “possible carcinogen” by the World Health Organization —in the same category as lead, engine exhaust, and DDT. Other physical problems relate to people who have metal in their bodies: dental metals (such as silver-mercury amalgams or gold inlays); or wear metal jewelry or metal eyeglasses (the metal intensifies the RF). People with pacemakers, prosthetic devices, and wireless insulin pumps have had medical problems due to RF interference. This is an unsafe technology, where we all are experimental lab subjects being used for dangerous levels of invisible but constant RF/EMF exposure. There is already an enormous public health threat to all of us. It is urgent for people to become informed. We must do this peacefully and COLLECTIVELY. 3. Join together and have public meetings. Demand of public officials that analogue meters be restored at no charge to customers. Where “Smart” meters have not been installed, demand that analogue meters be kept at no charge to customers. In some states, customers are charged up to $500 to op-out; while other power companies are charging a monthly rate to keep analogue meters. 4. People should flood ALL public officials with letters, as this is another way of harming us; and it is a complete invasion of our privacy. 1. Thousands of meter readers will be or are already out of work, with these “smart” meters installed. With jobs off-shored and millions of Americans out of work, where will these people find jobs? 2. On June 13, the US Department of Agriculture [USDA] announced that it had a goal of “investing $250 million in smart grid equipment deployment in rural America over the next 12 months.” (Newsroom-magazine.com) Is this tax-payer money? Why are they investing in dangerous technology? Why is there no public discussion? 3. Sempra Energy just posted its second quarter profits. According to PRNewswire (on Aug. 9): “Sempra Energy’s earnings through the first six months of 2011 were $769 million, compared with $328 million in 2010. There is a long history of deception in this country. Much of it involves our being uninformed experimental laboratory subjects for illegal testing of drugs and other products that have caused enormous harm to us. Remember the thalidomide scandal? Or, Toxic Shock Syndrome? Or the most recent one: the 2009 H1N1 Vaccines scam? None of the various “flu” vaccines were ever independently tested for safety. There were numerous reports that the H1N1 “flu” was geo-engineered. With Orwellian scare tactics, and no supporting evidence of any real “pandemic,” millions of doses were “forced” on hundreds of thousands of innocent people. Many children died. I know personally of the one-year-old grandson of a friend who was given an H1N1 vaccine and died two days later. There was no informed consent. No one was ever prosecuted. The corporate bottom line is all about profits. The Precautionary Principle [“first do no harm”] and our well being and safety are not included in that. We are all expendable for the bottom line. How much longer do we want to keep silent for continuous harm, lies, and deceit? 4. “See Ref. 4 above. 6. See Ref. 5 above. 8. EMR Policy Institute: www.emrpolicy.org June 5, 2011 Report, p. 2. 9. See Ref. 8 above. 12. Marti Oakley…See Ref. 5 above. Dr. Arnold previously was V-P for Lucent Technologies Bell Laboratories. 14. Dara Leigh Roberts. Letters to the Editor: “CMP’s attitude disdainful about customer’s interests.” Portland Press Herald: Aug. 15, 2011. 17. Important studies include: J. Phillips et al. “Electromagnetic fields and DNA damage. Pathophysiology (2009) Vol. 16, Issue 2: 79-88; M. Dämvik and O. Johansson. “Health Risk Assessment of Electromagnetic Fields: A Conflict between the Precautionary Principle and Environmental Medicine Methodology.” Reviews on Environmental Health (2010) Vol. 25, No. 4: 325-333; A. Frangopoulou et al. The Seletun Scientific Statement. “Scientific panel on electromagnetic field health risks: consensus points, recommendation, and rationales.” Rev Environ Health (Oct.-Dec. 2010) Vol 25, No. 4: 307-317; A. Kosowsky et al. “Effects of Cell Phone Radiofrequency Signal Exposure on Brain Glucose Metabolism.” JAMA. Aug. 1, 2011:http://jama.ama_assn.org/content/305/8/808.abstract; R. Baan et al. “Carcinogenicity of radiofrequency electromagnetic fields.” Lancet Oncology. (June 22, 2011) Vol. 12 Issue 7: 624-626; O. Johansson. “Electrohypersensitivity: state-of-the-art of a functional impairment.” Electromagn Biol Med. (2006) Vol. 25, No. 4: 245-258. An Orange County man claims OUC’s smart meter, which thousands of residents have on their homes, gave him major medical problems and he’s filed a federal lawsuit. Metallo lists his medical problems in the federal lawsuit he just filed against OUC over the smart meters. The digital meters are designed to make procedures easier for the company, and OUC has been installing them at thousands of Orlando homes over the past few years. After the smart meter was installed at Metallo’s home, he chose to opt out of the program. The company returned his analog meter but then added a $95 enrollment free and a $13 monthly fee. OUC said the fees were approved by Florida’s Public Service Commission, but Metallo claims it violates the Americans with Disabilities Act. “I want them to stop doing what they’re doing, it’s illegal what they’re doing,” said Metallo. The smart meters have been criticized statewide in the past, and some claim they’re linked to cancer. 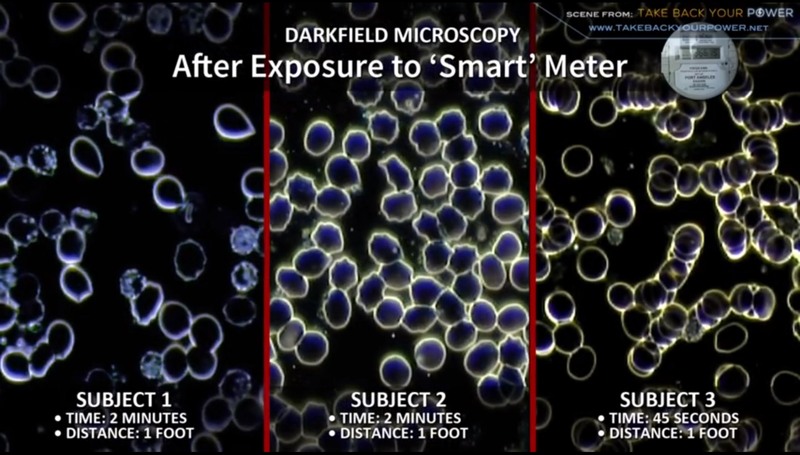 “Smart meters are emitting electromagnetic radiation that we can’t see or smell,” said biologist Diana Schultz. OUC said it couldn’t comment about the pending lawsuit in Metallo’s case, but denied the meters cause medical issues. “It’s fact. It’s proven,” said Metallo. A SMART meter has caused untold grief for a Balwyn­ North family of four, eventually forcing them out of their home. “I started having heart palpitations and not being able to sleep,” Mrs Lo Giudice said. “It would take me an hour to get to sleep and then I was constantly waking up every couple of hours. Int J Radiat Biol. 2017 Sep;93(9):990-999. doi: 10.1080/09553002.2017.1350768. Epub 2017 Jul 27. Biochemical and pathological changes in the male rat kidney and bladder following exposure to continuous 900-MHz electromagnetic field on postnatal days 22-59. Türedi S1, Kerimoğlu G1, Mercantepe T2, Odacı E1. To investigate the effect on male rat kidney and bladder tissues of exposure to 900-megahertz (MHz) electromagnetic field (EMF) applied on postnatal days 22-59, inclusive. Twenty-four male Sprague Dawley rats, aged 21 days, were used. These were divided equally into one of three groups, control (CG), sham (SG) or EMF (EMFG). CG was not exposed to any procedure. SG rats were kept inside a cage, without being exposed to the effect of EMF, for 1 h a day on postnatal days 22-59, inclusive. EMFG rats were exposed to continuous 900-MHz EMF for 1 h a day under the same conditions as those for the SG rats. Rats were sacrificed on postnatal day 60, and the kidney and bladder tissues were removed. Tissues were stained with hematoxylin and eosin (H&E) and Masson trichrome for histomorphological evaluation. The TUNEL method was used to assess apoptosis. Transmission electron microscopy (TEM) was also used for the kidney tissue. Oxidant/antioxidant parameters were studied in terms of biochemical values. The findings showed that tissue malondialdehyde increased in EMFG compared to CG and SG in both kidney (p = 0.004 and p = 0.004, respectively) and bladder tissue (p = 0.004, p = 0.006, respectively), while catalase and glutathione levels decreased compared to CG (p = 0.004; p = 0.004, respectively) and SG (p = 0.004; p = 0.004, respectively). In the EMF group, pathologies such as dilatation and vacuolization in the distal and proximal tubules, degeneration in glomeruli and an increase in cells tending to apoptosis were observed in kidney tissue. In bladder tissue, degeneration in the transitional epithelium and stromal irregularity and an increase in cells tending to apoptosis were observed in EMFG. Additionally, EMFG samples exhibited glomerular capillary degeneration with capillary basement membranes under TEM. We conclude that continuous exposure to the effect of 900-MHz EMF for 1 h a day on postnatal days 22-59, inclusive, causes an increase in oxidative stress and various pathological changes in male rat kidney and bladder tissues.